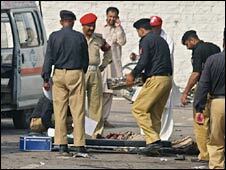 A bomb attack has hit the Marriott Hotel in the Pakistani capital, Islamabad, killing at least 31 people. The blast created a 20ft (6m) deep crater, and destroyed the entire front section of the hotel. 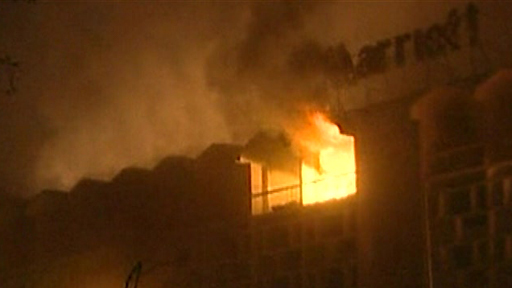 She says the building is engulfed in flames, and rescue workers are carrying out bloodied victims and bodies. Police say the blast occurred as a lorry approached the hotel and they suspect it was a suicide attack. Police estimate that the blast was caused by more than a tonne of explosives. They are warning that the hotel could collapse. Our correspondent says that the centre of the blast was at the front of the building close to the area where security checks are carried out. She says that about two-thirds of the 290-room hotel is on fire, and the wounded and dead are still being brought out, on stretchers or wrapped in sheets. She says the emergency services have been unable to reach the upper floors of the hotel, where more people are feared to be trapped. 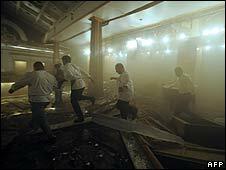 A hotel employee, Mohammad Sultan, said he was in the reception when something exploded, forcing him to the ground. “I don’t understand what it was, but it was like the world is finished,” he told the Associated Press news agency. There are reports that the explosion brought down the ceiling of the banquet hall, where some 300 people were sharing a meal to break the fast during the holy month of Ramadan. The Marriott is located near government buildings and diplomatic missions. Security there is tight, with guests and vehicles subject to checks. The hotel is popular with foreigners visiting Pakistan or members of the expat community, and has previously been the target of militants. Last year a suicide bomber killed himself and one other in an attack at the hotel. The bomb attack comes just hours after Pakistan’s newly installed President, Asif Ali Zardari, said he would not allow Pakistan’s territory to be violated by terrorists or foreign powers fighting them. In his first speech to MPs since he replaced Pervez Musharraf in August, he vowed instead to “root out terrorism and extremism wherever and whenever they may rear their ugly heads”. He was speaking in Islamabad, just several hundred metres to the east of the Marriott. Pakistan has been a key ally of the US in its “war on terror”, but relations have become strained over tactics. In recent months, Pakistan has voiced growing disquiet over US raids targeting militants in its territory, launched from neighbouring Afghanistan. Al-Qaeda and Taleban militants based in Pakistan’s north-west tribal region have repeatedly carried out attacks across the border in Afghanistan. 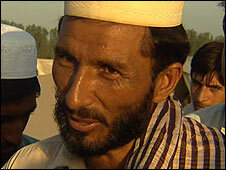 Militants have also carried out waves of attacks in Pakistan in recent years. The residents of Sheikh Yasin camp are not celebrating the inauguration of Pakistan’s new president. They jostle each other as they wait for hand-outs of bread and queuing for soup, ladled out from huge vats under a canvas tarpaulin crusty with flies. More than 2,000 people have fled to the camp to escape an army bombing campaign against the local Taleban in the Bajaur tribal area near the Afghan border. More civilians were killed than militants, they say. For many Pakistanis, this is what the “war on terror” has brought: displacement and death. There is resentment and anger. Despite, or perhaps because of, the high price that Pakistan has paid since 9/11, there’s no consensus in the country about how to confront Islamist militancy. Now with a new president and a relatively new government, once again questions are being raised about the country’s counter-insurgency policy. 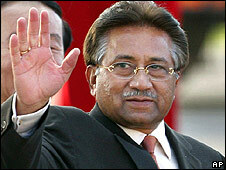 Pakistan’s former military leader Pervez Musharraf swung between military offensives and peace talks with militants. Neither worked, and the general, although a key American ally, was accused of playing a double game by maintaining links with the Taleban. 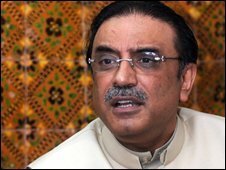 It’s not clear if it will be any different under the new civilian President, Asif Zardari, who took the oath of office this week. During his party’s short six months in government, it has also tried both war and peace. 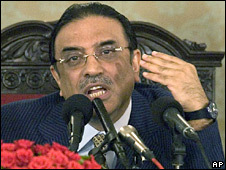 But at his inaugural press conference, Mr Zardari seemed to signal a new line. He shared the podium with Hamid Karzai, the Afghan president who has accused Pakistan of harboring and supporting the Taleban. They pledged co-operation against the militants, something for which Washington has long been pressing. “I think so far Mr Zardari has been more forthright and more articulate [than Musharraf] in his belief that the war on terror has to be fought with greater intensity and sincerity,” says Tariq Fathimi, a former ambassador to the United States. But for many in Pakistan, his performance has only strengthened impressions that he’s America’s man, and that’s a problem. Most Pakistanis are opposed to their government’s participation in what they call America’s war. And a recent surge in US air strikes against suspected militant targets in Pakistan’s border region has not helped the new government. “It is making things rather impossible for us,” says Rehman Malik, head of the Interior Ministry, “because when the people hear of an alien attack, nobody likes it, we’re talking about the sovereignty of our country. It’s not just the people – Pakistan’s army is also angry, and it’s still the country’s most powerful institution. Any new policy or approach by Asif Zardari would need its backing to be successful. Analysts say the army is unsure about Mr Zardari but willing to work with him, especially if he can deliver clear parliamentary support for military action. That source of popular legitimacy was sorely lacking under the previous administration. But the US air strikes complicate the relationship with the government. “Within the army there is strong thinking that we are being let down by the government if it doesn’t respond,” says retired General Talat Masood. There’s no doubt Pakistan is facing a huge problem of Islamic militancy. But many are convinced it can’t tackle this if it’s seen to be acting at America’s behest. “Probably the only way to reverse it is to initiate a parliamentary debate,” says Zaffar Abbas, the Islamabad editor of Dawn Newspaper, “to have a home-grown policy to deal with militancy and religious extremism, which is somewhat de-linked from the American demand to have an international campaign against terrorism. Asif Zardari may have signalled that he’s willing to work closely with America. But as a democratically elected leader, he also says he’ll be directed by parliament. How he handles that is crucial. His challenge is to truly make this Pakistan’s war. Shots have been fired at the motorcade of Pakistani Prime Minister Yousuf Raza Gilani, although it is not clear if he was in the convoy at the time. Two bullets from an unidentified gunman hit the PM’s car as he was traveling from Islamabad airport into the city, his press secretary told. But security officials say the car was on its way to collect Mr Gilani. 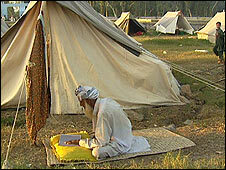 Mr Gilani’s government is grappling with a growing threat from militants in the country. It is not clear who fired the shots but Islamist militants based in Pakistan’s border regions have threatened to kill various government ministers, and have carried out deadly suicide bombings against army and government targets. The incident represents a major lapse in security. In December former Prime Minister Benazir Bhutto was killed at an election rally in Rawalpindi. “I can confirm the prime minister’s convoy was fired upon while returning from [Islamabad] airport,” his press secretary Zahid Bashir told. A statement issued by the prime minister’s office said: “Of the multiple sniper shots fired on the prime minister’s vehicle, two hit the window on the driver’s side. 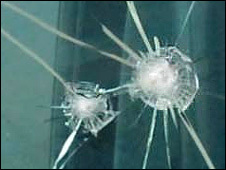 Television pictures showed the shattered glass of the driver’s door. Officials say another car in the convoy was also hit by several bullets. There are no reports of injuries. However, there was confusion when the interior ministry gave a different account of the incident, saying that Mr Gilani was not in the car at the time of the attack. 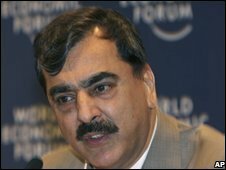 Mr Gilani had been in Lahore to canvass support for Asif Zardari, Ms Bhutto’s widower, ahead of presidential elections on Saturday. Ms Bhutto had been favorite to win Pakistan’s general elections and become prime minister for a third time before she was killed on 27 December. The elections were subsequently postponed until February. The coalition broke up amid political acrimony late last month. One of the biggest challenges facing Mr Gilani’s government comes from Islamist militants who control large areas along the border with Afghanistan. The army has been engaged in a major operation in recent weeks in the district of Bajaur which is estimated to have displaced up to 300,000 local people. This week the government said the Bajaur operation would be suspended during the holy month of Ramadan. 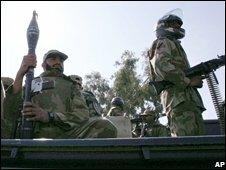 Last year militants grew increasingly confident and carried out a series of attacks in Islamabad and Rawalpindi, the country’s main garrison town. And last month a double suicide attack at a munitions factory in the town of Wah in Punjab province left nearly 70 people dead. The loose alliance of militants that calls itself the Pakistan Taleban claimed responsibility for the Wah incident, the heaviest attack on a military installation by a militant group in the country’s history. Mr Gilani’s PPP and Mr Sharif’s PML-N have spent much of their time since February arguing over issues such as the power of the presidency and the reinstatement of judges sacked by former President Pervez Musharraf. During that time the economy has taken a further battering, with the Pakistani rupee falling to an all-time low, while food and fuel prices have risen sharply. Leaders of Pakistan’s ruling coalition are to meet in Islamabad to discuss who will succeed their long-time opponent, former President Pervez Musharraf. 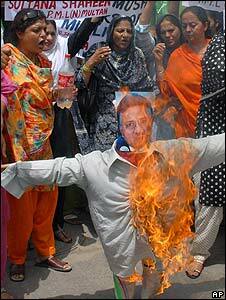 Mr Musharraf stepped down on Monday after nine years in power to avoid a move by the government to impeach him. The coalition, led by the parties of the late Benazir Bhutto and ex-Prime Minister Nawaz Sharif, held a first, inconclusive round of talks on Monday. Mr Musharraf was replaced automatically by caretaker President Muhammad Sumroo. Mr Sumroo, speaker of the Senate and a political ally of Mr Musharraf, will lead the country until a new election is held by parliament. 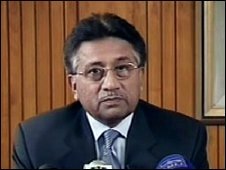 It is unclear whether Mr Musharraf, who took power in a bloodless coup in 1999, will face prosecution now that he is out of power. On Monday, Mr Sharif, who leads the Pakistan Muslim League-Nawaz (PML-N), met Asif Ali Zardari, leader of the Pakistan People’s Party (PPP) of Benazir Bhutto, and other coalition figures. Sources say their talks focused on the nomination of the next president and the restoration of judges deposed by Mr Musharraf. 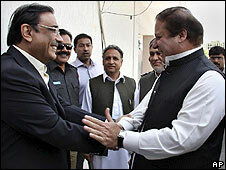 The PPP and PML-N distrust each other and have already said different things about Mr Musharraf’s future. Mr Zardari’s party said it believed he might have immunity from prosecution. The parties are also likely to differ on whether to reinstate the judges and are thought to have differences of emphasis on how to tackle a violent Islamist insurgency on the Afghan border, our correspondent says. There is relief in Pakistan that Mr Musharraf is gone but mounting impatience with the political parties that won February’s elections. Pakistan’s newspapers on Tuesday celebrated the exit of former president. The headline of The Daily Times was “Going, Going, Gone!”, next to a photo of Mr Musharraf, while The News led with “Mush Quits With His Tail Between His Legs”. The country’s media also speculated about what he might do next, reporting that he wants to stay in Pakistan, but may soon travel abroad, with Saudi Arabia, the US, the UK and Turkey mentioned as possible destinations. Mr Musharraf left his official residence in Islamabad for the last time after announcing his resignation in a televised address. He inspected a last military guard of honour before leaving the palace in a black limousine. After nine years in power, Pervez Musharraf had finally run out of options, the BBC’s Chris Morris reports from Islamabad. Well known in the West for his support for the US after the 11 September 2001 attacks, he had grown increasingly unpopular at home. With the government on the verge of impeaching him, the former soldier’s instinct was to fight on, our correspondent says, but in his lengthy address he said he was stepping down for the good of the nation. It is a landmark moment in Pakistan, our correspondent adds: the former military ruler forced from office by civilian politicians and the army standing by and allowing it to happen. Mrs Bhutto’s son and heir, Bilawal, said he hoped the country could move forward after Mr Musharraf’s departure. “I see that the biggest hurdle in the way of democracy has been removed,” he said. Mrs Bhutto was assassinated in Rawalpindi in December last year. Pakistan’s foreign minister has said President Pervez Musharraf must stand down in the next two days or face impeachment proceedings. “Musharraf is running out of time”, said Shah Mahmood Qureshi, of the Pakistan People’s Party (PPP) – a major partner in the governing coalition. Draft charges against the president include violation of the constitution and gross misconduct, officials said. Mr Musharraf’s office has said he will not resign and will defend himself. The impeachment campaign was launched last week by leaders of the PPP and the Pakistan Muslim League-Nawaz (PML-N), led by former prime minister Nawaz Sharif. If Mr Musharraf chooses not to quit, he would be the first president in Pakistan’s history to be impeached. A spokesman for the Pakistan Muslim League-Q, a pro-Musharraf party, said that the president’s advisers were considering his options. 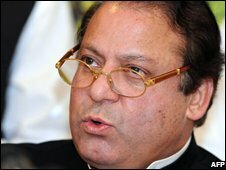 Nawaz Sharif, who was toppled in the 1999 coup, said he was opposed to any deal which would give his old rival a “safe passage”. He has said the president should be tried for treason, which carries the maximum sentence of the death penalty. But the PPP, the party of assassinated former Prime Minister Benazir Bhutto, says the decision of whether to put the president on trial should be left to parliament. Information Minister Sherry Rehman, said the PPP “never indulges in the politics of revenge as it wants a stable Pakistan and a sustainable democracy in the country”. Support for the president in a recent vote of confidence in the provincial assemblies has almost entirely collapsed. Mr Musharraf’s best way out would now seem to be a dignified exit before parliament meets to debate the impeachment, our correspondent says. Talks are going on behind the scenes. The ruling coalition parties will have to decide where the former army chief, a key ally in Washington’s war on terror, is allowed to live and what protection he will receive, our correspondent says. Mr Musharraf came to power in a bloodless coup in 1999. He gave up control of the army last year and his allies were defeated in February’s elections but he retains the power to dissolve parliament. But his public standing suffered a huge setback in 2007 when he sacked Pakistan’s chief justice and nearly 60 judges to prevent them from overturning his re-election as president. But analysts say the president is still thought to have heavy influence over the military and its reaction will remain crucial. 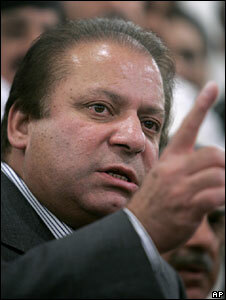 Pakistan’s ruling coalition parties say they will begin impeachment proceedings against President Pervez Musharraf. 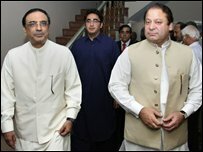 Party leaders Asif Ali Zardari and Nawaz Sharif made the announcement after three days of talks. They would need a two-thirds majority to impeach. Mr Musharraf took power in a bloodless coup in 1999. Mr Musharraf has previously said he would resign rather than face impeachment proceedings. But late on Thursday, aides said the president would respond to the allegations in parliament. The BBC’s Mark Dummett in Islamabad says an impeachment would take Pakistani politics into new territory, since no Pakistani leader has faced it before. Mr Zardari, of the Pakistan People’s Party (PPP), and the PML-N’s Narwaz Sharif announced the impeachment move at a press conference in Islamabad. The leaders say they will also move to have Mr Musharraf face votes of confidence in the national and four provincial assemblies. Our correspondent says these will not be enough to dislodge President Musharraf but might weaken him ahead of any impeachment showdown. Impeachment would need a two-thirds majority in the upper and lower houses of parliament but, our correspondent says, getting those numbers might be difficult. The two leaders also promised to restore judges sacked under Mr Musharraf’s emergency rule once impeachment was successful. How to proceed on that issue had caused deep divisions between the two coalition parties since the elections. Mr Musharraf had been scheduled to attend the opening of the Olympic Games in Beijing but has cancelled his trip and will be replaced by Prime Minister Yousef Raza Gilani. Mr Musharraf was elected president for a five-year term last October in a controversial parliamentary vote. One presidential source told AFP news agency Mr Musharraf was discussing a course of action and had the options of dissolving parliament or imposing emergency rule again. The president is still thought to have heavy influence over the military and its reaction will remain crucial. Pakistan has been ruled by military leaders for more than half of its existence since Partition in 1947.